Therapy monitoring in oncological patient care requires accurate and reliable imaging and post-processing methods. RECIST criteria are the current standard, with inherent disadvantages. The aim of this study was to investigate the feasibility of semi-automated volumetric analysis of lymph node metastases in patients with malignant melanoma compared to manual volumetric analysis and RECIST. Multislice CT was performed in 47 patients, covering the chest, abdomen and pelvis. 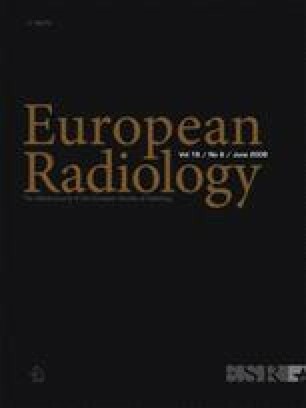 In total, 227 suspicious, enlarged lymph nodes were evaluated retrospectively by two radiologists regarding diameters (RECIST), manually measured volume by placement of ROIs and semi-automated volumetric analysis. Volume (ml), quality of segmentation (++/−−) and time effort (s) were evaluated in the study. The semi-automated volumetric analysis software tool was rated acceptable to excellent in 81% of all cases (reader 1) and 79% (reader 2). Median time for the entire segmentation process and necessary corrections was shorter with the semi-automated software than by manual segmentation. Bland-Altman plots showed a significantly lower interobserver variability for semi-automated volumetric than for RECIST measurements. The study demonstrated feasibility of volumetric analysis of lymph node metastases. The software allows a fast and robust segmentation in up to 80% of all cases. Ease of use and time needed are acceptable for application in the clinical routine. Variability and interuser bias were reduced to about one third of the values found for RECIST measurements. We would like to thank our technicians Martina Jochim and Adelheid Fuxa for performing the CT examinations and data transfer support. H.-U. Kauczor holds research grants from Siemens Medical Solutions and Toshiba Medical Systems.